Before making an assignment in bankruptcy it is important to understand all of your options. If the majority of your debt is tax related we can help make a payment arrangement that works for you. In some cases undergoing taxpayer relief may be another option. With penalties and interest, the debt may be too much to ever pay off. In these cases, bankruptcy may be an alternative. We provide bankruptcy representation to all of our clients considering bankruptcy. This is to ensure that you fully understand the obligations and requirements of making an assignment in bankruptcy. We even will attend the initial meetings with the trustee to ensure you are comfortable with the conditions of the bankruptcy. 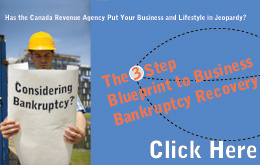 If you are a self-employed individual and are worried about what bankruptcy will do to your way of life take a look at our 3 step blueprint to business bankruptcy recovery.